Lomax » Fri Mar 09, 2018 11:05 pm wrote: If you were paying attention you'll have noticed that I acknowledged their relation to success and solvency. What we should not do is confuse those things with the entire notion of intelligence. Spatio-temporal reasoning, unlike race, is not a dubious concept. But it is a narrow one. I didn't say we should confuse anything and what difference does it make. The argumentation from the scientific perspective is that science doesn't care about anything but facts, and that technology can be put to use by good people and bad people. So my argument is if the science is stronger then people will be less able to contend against the facts. Hunt writes that despite the limitations of Lynn and Vanhanen's data, their conclusions about the correlation between IQ and measures of social well-being probably are correct. This is partially driven by large differences in prosperity and intelligence test scores between regions of the world, with the highest tested IQ scores for East Asian countries such as Taiwan, Singapore, Japan, South Korea and China, followed by North America and Europe with intermediary IQ scores, followed by Middle Eastern Arab and South American countries such as Israel and Mexico with the lowest recorded IQ scores for sub-Saharan Africa and South Asian countries such as Bangladesh, India, Pakistan. However, substantial correlations between intelligence test scores and measures of well-being also exist when the analysis is limited to developed countries, where the IQ results are more likely to be accurate. There are some well recognized points to be taken into account. For example, we know that IQ scores have risen by 10 points or so (so if people today were to take the test from 30 years ago they'd likely score much higher.) This has been suggested to be do with better education and more application of technological know how in our day to day lives. So if we look at the rankings we can begin to appreciate that countries where people have less structured education in place and lack exposure to technologies, citizens in developed countries take for granted, we have one factor. What is widely used by racist groups is the data that points toward Africans having a lower average IQ. I think the above point dismisses such claims and the only solid evidence to back up this claim is by taking adoption into account (but there the data set is very small and the nutritional aspects of prenatal development are not taken into account.) It is far from conclusive to say the least! What is happening is society is more and more jobs are becoming more and more complex. Some jobs require a certain cognitive capacity, so it is in general human interest to look at how to allow human intelligence to flourish so people are able to be independent. As an example of extreme culture shock we have seen many cases where archaic tribes have been dragged into the modern world. The effect is traumatic and trauma inhibits cognitive ability. Is this the responsibility of scientists to deal with the situation or is Dennett (as mentioned above by someone) correct in saying we should bother ourselves with this issue when it is already being used to propel fundamentally amoral ideologies? Can the laying bare of facts really help the situation without careful scientific interpretation? Can scientists afford to merely present the data and say nothing about what it does say, could say, and doesn't say? Are social scientists irresponsible or simply badly trained in how they present their data or is this due to some people pushing vicious agendas? How can we instill the greater need for careful interpretation? Mentioned above by someone else is my own major concern. The "Information Age" we're in. Now, more than ever, there is a flood of information readily available to everyone - yet it seems this has presented a great deal of problems along with its obviously positive repercussions. How do graphs become action? What is the appropriate action? Have high-school teachers make up IQ tests that they deem appropriate to their students. Choose the teachers thus: one from the most expensive private school on each sub-continent, one from a poor inner city school and one from a rural school in each of those same districts. Take the stack of test papers, throw them all up in the air, then have an illiterate janitor pick them up and stuff them into envelopes addressed to the regions being tested. Send them out, have the subjects take whatever test arrives. Serpent » March 9th, 2018, 6:46 pm wrote: My deepest suspicion regards that "correlation" of success with IQ. wolfhnd » March 9th, 2018, 5:44 pm wrote: The question that Charles Murray is asking is how can people with different IQs live together in a technological world that dramatically favors high IQ. There is a HUGE difference between a correlation of success with IQ and "dramatically favors high IQ." The first is only natural and I don't see how you would not expect this, but the second I think is just wrong. If there is a correlation between race and IQ and if East Asians have, on average a higher IQ, and given that East Asia is dominated by communist China, plus a few other communist countries thrown in, then would we conclude that communist China, etc., are the product of a higher IQ or leads to people having higher IQs? They simply have higher expectations of their children. First, the culture encourages discipline, duty and attention (The much-vaunted protestant work ethic is a comparative picnic!). Second: There is * no megaprofit in keeping people childish as long as possible. Third: uniformly rigorous standard of education. By the age of IQ testing, all the children will have taken lots and lots of tests. Practice makes a world of difference in performance. This is why I suggest exchanging IQ tests. I suspect that one of the things distorting this discussion is that everyone here is rich but think they are not part of the elite that doesn't have muscular professions. 71 percent of Americans make less than $50,000 a year. College tenured professors and administrative staff are well paid and isolated from the concerns of workers. Forest_Dump » Sat Mar 10, 2018 7:27 pm wrote: If there is a correlation between race and IQ and if East Asians have, on average a higher IQ, and given that East Asia is dominated by communist China, plus a few other communist countries thrown in, then would we conclude that communist China, etc., are the product of a higher IQ or leads to people having higher IQs? Doesn't hold for Japanese and South Koreans. Bottom line is it would be extraordinary if intelligence doesn't have as much of a genetic bases as other traits such as height and lactose tolerance. I think Steven Pinker needs to work harder to dispel the blank slate myth. wolfhnd » March 10th, 2018, 5:43 pm wrote: I suspect that one of the things distorting this discussion is that everyone here is rich but think they are not part of the elite that doesn't have muscular professions. 71 percent of Americans make less than $50,000 a year. College tenured professors and administrative staff are well paid and isolated from the concerns of workers. What's that got to do with the accuracy or relevance of IQ tests? Other than what I mentioned, ad nauseum: that the designer of the test has a different view of the world than the majority of potential subjects. No matter how much data one gathers from how many sources, there will never be more than few corner offices - and they will never be occupied by the most clever or most honest or most experienced people: their occupants will always be chosen by the privileged from among their own kind. Check your privilege and you will see you are most likely in a situation analogous to a corner office compared to most of the people in the world. Most people have some sort of unearned privilege and for the most part it is irrelevant to the more serious issues the world faces. I have had many jobs and most of the time those that sit in the corner office may not have been the most clever, honest, or experienced but they were certainly above average in at least two of those qualities. World view has little to do with the ability to employ technology to reduce poverty and build a relatively free and functional society. Multiculturalism is for the most part an attempt to shed the quilt of unearned privilege by westerners who have forgotten how hard life was for their ancestor who's blood sweat and tears made our lives of relative luxury possible. wolfhnd » March 10th, 2018, 9:51 pm wrote: Check your privilege and you will see you are most likely in a situation analogous to a corner office compared to most of the people in the world. Nothing of the kind. Comfort in old age is in no way analogous to wielding power in industry or world affairs. My intelligence never got me any higher than rank-and-file employment at a reasonable salary. I'm lucky enough to have had a [not all that pleasant] father who immigrated to Canada, and to have lived during an era of prosperity and liberal attitudes. Most people have some sort of unearned privilege and for the most part it is irrelevant to the more serious issues the world faces. If most people have it, it's not privilege. And that's not the point. Most people cannot have leadership positions, or influence or clout - ever. The people who do have it, don't want to give it up. And technology will not make more such positions; it will make ever less employment of any kind. I have had many jobs and most of the time those that sit in the corner office may not have been the most clever, honest, or experienced but they were certainly above average in at least two of those qualities. And they earned that position through IQ testing, or racial profiling, or what? In my experience, executives were people who held degrees in business administration, which isn't nearly as demanding as paleontology, which pays less and you don't get to push people around. Medicine is pretty challenging; you need to be above average in both intelligence and stamina for that. World view has little to do with the ability to employ technology to reduce poverty and build a relatively free and functional society. World view has everything to do with the willingness to try! Multiculturalism is for the most part an attempt to shed the quilt of unearned privilege by westerners who have forgotten how hard life was for their ancestor who's blood sweat and tears made our lives of relative luxury possible. I'm not sure how this applies. Does knowing the IQ of Koreans make a difference to unfree and dysfunctional societies? Anyway, I bet the Koreans - even if they score overall a couple of points higher than Americans on standardized tests - spread over much the same Bell curve as any other nation's population. What changes by comparing national Bell curves? What changes by knowing that there are more brown than beige people on the up-slope and more olive than pink people on the down-slope? how about looking at the UK. In the UK young white males are not performing as well as Indian or Chinese immigrants. The situation has fluctuated over time, so we can conclude that either intelligence has dropped for one particular group because of genetics, or that there are far more intricate details involved. Of course, I am assuming that school tests are an indicator of "intelligence." I am assuming we can all agree that in general someone who is more intelligent will get better grades than someone less intelligent - if you don't think so then I guess you don't regard anyone as being either bright or dull. I don't think we can say Communism is one wide sweeping factor. When talking about the attitudes and cultures of particular groups of people's I think we can agree there is more at play than merely the diffuse ideas of Communism at play in the population mass. I would consider patriotism and identity to be important factors because a sense of self and place would, I imagine, create more "positive" feelings - as a spin-off Communism expresses a sense of unity, and we could well argue that Japanese culture has this too. There is also a deep sense of tradition and respect involved. In psychology the aim has been to separate personal characteristics rather than lump them together - the issue is then understanding, and roughly calculating, how are not stand alone attributes of human beings. Then we have others factors like "openness." When someone specializes in one subject and becomes an expert, they may not be open to other areas of study too much. For this reason I would expect to see openness to correlate to some visible degree with IQ, because IQ is very basically speaking, a means of measuring the kind of problem solving capacity that works across multiple field and through multiple dimensions - like when you learn another language learning a third and a forth becomes easier and easier as you lay down the general structuring of the group of "all languages." As for morality I have seen people argue that low IQ means you'll be more likely to be a criminal. This is untrue even though the stats support the idea. All it really shows is that the criminals with lower IQ's are more likely to get caught. What riles people up about this subject is that they feel hard done by when other people are better than them as this or that, they deplore that someone can be more accomplished in this or that field, and then say "it is not fair" that Usain Bolt can run so fast, he doesn't deserve it because he merely "inherited" some genes, so when I race against him I should be given a head start to make things "fair." The fact that some people have to work harder to achieve this or that than other people is the root of all political rhetoric. I am not going to to employ someone with high IQ who is lazy, nor am I going to employ someone based purely on their IQ score; yet when people go for an interview they present their personal ability (IQ) in the reduced form of particular fields of competence and knowledge. There is reasonably good data to back this up, because after a couple of generations in the UK the children of the children of the children of immigrants tend to fall into more "British" attitudes and don't feel the urgency to excel - hence a reason why some far eastern countries excel in education (they are instilled to do so.) Korean's are especially crazy when it comes to work ethic; more so than Japanese. What is more likely the case for higher average IQ in the far east is partially down to meritocracy than down to communist attitudes. Does it make a difference? Well, yes! If we can show them that even though their country is currently at the bottom of the pile, if as a nation they work together and understand that hard work pays off then they may prefer to try rather than buy into victimhood, it would likely decrease genocide. Plus the nations who are not at the bottom of the pile would thenb invest in these coutnries knowing that it isn't the people that are to blame, it is simply the situation and they, if given the chance, will work harder than some "comfortable" westerner - of course some people will then call this "exploitation", and that is not to deny exploitation, only to say there are benefits too, not just negatives. I am not pretending this is a simple problem. I am suggesting that because of its complexity (on multiple levels of research and across multiple fields of knowledge) it is perhaps worth looking into more closely - and with caution. Jung said, that which you most desire is where you are least willing to look. We fear these topics because we know they are dangerous, yet we know deep down there is value underneath. I am asking if we are ethical and competent enough to begin to look or whether science wants to hold such things at arms length because generally scientists are human and therefore understand the political force in this area and don't want to get involved in more "subjective" and emotional issues. BadgerJelly » March 11th, 2018, 12:49 am wrote: how about looking at the UK. In the UK young white males are not performing as well as Indian or Chinese immigrants. The situation has fluctuated over time, so we can conclude that either intelligence has dropped for one particular group because of genetics, or that there are far more intricate details involved. No mystery. If you want to track the successive waves of immigration to Canada, just look at the honour rolls in the lobby of a Toronto high-school. Dutch names, Italian names, Greek names, Hungarian names, Vietnamese names, Ukrainian names dominate in a predictable +/-5-year pattern. Immigrant children are driven by anxiety, a strong desire to fit in, interest in the new and unfamiliar, appreciation of this opportunity, a need to prove their worth, and a debt to their arents, who usually make big sacrifices to secure their children's future. Once they have professions, they move to the suburbs and blend into the general population. Their children take everything for granted and stop trying. Of course, I am assuming that school tests are an indicator of "intelligence." No; school exams are a measure of how much of the academic material is retained at the end of the term. That doesn't mean it will be retained for life, or even that it's thoroughly understood. High grades do not reflect the amount of work that has gone into earning them. Intelligent students learn the same material in less time and with less effort than average IQ students. Even the very slow can do well if they get help and work hard enough. I am assuming we can all agree that in general someone who is more intelligent will get better grades than someone less intelligent - if you don't think so then I guess you don't regard anyone as being either bright or dull. That doesn't follow at all. If they both work equally, an intelligent student scores higher than an unintelligent one. But grades mostly come down to ambition. Many of my bright classmates were occupied elsewhere, to the detriment of school-work (which was booooring!) We knew we could pass without trying. I have not encountered the IQ test which demonstrates either of those assertions. What they show is that some people are better at patterning numbers and some are better at rotating weird shapes. The ones who can - and like to ! - do both will score higher. Highest of all will be those who have done many IQ tests. Also: it's inconvenient to ask: Why is a criminal? Couldn't get a job? Was persecuted and became bitter? Had to drop out of a violent school? Is easy for more clever criminals to exploit? Fell prey to an addictive substance? Tried to help his family? Marched in a protest? Talked back to cop? Caught a fish in a private river? Walked across an upscale white neighbourhood? Got into a fight? I wish it were this simple! Um... Isn't that what an employer is looking for? What else would applicants present? What's Dennett got to do with race and IQ? what do you propose to do with the information? Also, your "no mystery" point will become more than merely conjecture - not that I disagree with you point, just that it is complicated and so we shouldn't assume the obvious and find data that fits it. The evidence for the strength of correlation between income is quite pronounced. If someone has a high IQ and they are industrious, then they are more likely to earn more money and have more academic success. Of course there are exceptions, but as predictors there are no two better ways to predict financial or academic success then to look at IQ and industriousness. Someone else mentioned Dennett I guess. I am really interested in how we handle these things ethically. You even ask yourself what we'd do with the results? We're quite happy to pump pollutants into the atmosphere without really thinking about the consequences too much, but we're willing to talk about them with getting too upset (most of the time.) What puzzles me is how talking about intelligence and different groups of people is somehow more sensitive than concern for the destruction of the human race. Maybe if we looked more closely we'd start working together more and addressing problems as a species rather than as groups within a species? Just a thought. If one has a high IQ and they are industrious, then they are more likely to earn more money and have more academic success. Of course there are exceptions, but as predictors there are no two better ways to predict financial or academic success then to look at IQ and industriousness. There is one better indicator : family origins. Being born close to the finish line beats any amount of industry and smarts in those who start outside the arena. Especially if the gates are barred. Forget the IQ tests. Concentrate on levelling the field, opening the opportunities and let people compete if they want to. But, again, compete for what? There will never be more jobs, or more leadership positions. No idiot ruler will step aside to make room for a smart one. I am really interested in how we handle these things ethically. We don't. Never have; certainly won't start in an age of wide-spread Trumpism. You even ask yourself what we'd do with the results? Asians are on average 3% more adept at math than Europeans. Africans scored highest in spatial orientation, 2% above Hispanic Americans. Euro-Americans were 4% above Native Americans in verbal skill, but 5% below in pattern recognition. What will anybody actually do? What puzzles me is how talking about intelligence and different groups of people is somehow more sensitive than concern for the destruction of the human race. It's not sensitive. It's just useless. Pollutants make money, so we understand why those who have the ability to stop dumping them don't stop dumping them, even though the very intelligent people who have no control of anything have been telling them for over a century what the result would be. Maybe if we looked more closely we'd start working together more and addressing problems as a species rather than as groups within a species? Improbable. Comparing their relative sizes of anything has never led to co-operation. Can you show me the evidence that indicates famiky origin is a better indicator? I am not sayng it isn't a factor, only that I've seen no evidence to suggest it is a stronger indicator of success. What would I do with the data? Look more at it. I don't quite understand what you want to me to say? I find the differences and effects of different human cultures interesting. Ethically we're going to have to deal with this sooner rather than later. Comparing sizes has never led to cooperation? It is almost like you refuse to accept the benefits reaped from scientific advances. You don't have a leg to stand on there, sorry. BadgerJelly » March 11th, 2018, 10:00 pm wrote: Can you show me the evidence that indicates famiky origin is a better indicator? Also, of course, if a kid's parents are well off, he will have the best possible prenatal care, infant health, childhood nutrition, a stimulating environment, excellent education in exclusive schools; if he's still a bit behind at exam time, private tutoring and/or enough money to buy essays from more gifted but less endowed students. Then he's guaranteed admission to the university of his father's choice, if necessary with the intercession of his father's fellow alumni. He's guaranteed tuition and comfortable quarters, and if he doesn't do a lot of actual work, he'll graduate anyway. Once out of school the ready-made position is waiting for him; he has the contacts; he belongs to the club. For a slum kid, no matter how intelligent, to get the same degree, he'd have to fight the odds from birth onward. like salmon, only the toughest and luckiest make it. The other 99 are never heard from. You may pretend not to know this, but everyone else does. What would I do with the data? Look more at it. That's harmless enough. And changes nothing. I find the differences and effects of different human cultures interesting. Many things are interesting. Cultures are far more interesting and complicated than IQ scores. I don't see the relevance of the latter to understanding the former. Ethically we're going to have to deal with this sooner rather than later. What makes you think that? What makes you think IQ is linked in any way to ethics? Who is the "we" in that statement? What is it "we" have to deal with? Why do "we" have to deal with "it"? How do we apply ethics to it? Comparing sizes has never led to cooperation? It is almost like you refuse to accept the benefits reaped from scientific advances. Scientific advance was never about two countries, or two races comparing their respective attributes. Science is about individuals discovering natural phenomena. Size-comparison between countries is usually about GDP, resources, territory, missiles and armies. You don't have a leg to stand on there, sorry. Glad you're sitting down :) Me too! The problem with that article, or rather your pushing it as evidence, is that it is appealing to a very tiny extreme proportion and ignoring how it was that the parents could get to the position they got to in the first place. Excuse me for stating the seemingly obvious, but, I understand perfectly well that the rule doesn't work on all levels, and that "intelligence" may or may not be down completely to either environment nor genetic predisposition. What we can tell is that two people born into poverty who differ in industriousness and IQ are predictably going to "perform" differently in society. Extreme cases reveal flaws but they are not worth considering without appealing to both ends of the pole. Someone with high IQ and high industriousness is going to either gain or keep money more easily than someone who is, to put it more bluntly technically less competent in the area they work in and less industrious. This is not to say that less competence in one area or less of an industrious attitudes makes them "worse" people, because they may be better suited to less competitive environments where empathy is more fitting although less economically rewarding. You're better off being born with a high IQ than wealthy. At the end of your life you're more likely, over all, to be in a better position because of high IQ than low IQ - monetarily speaking. And my argument is basically knowing, and wanting to question, is less harmful than not looking. Did Einstein set out to change the face of the planet as we know it? No, he did not. And maybe some people would argue we'd be better off now without him, although I wonder if that would be true and I guess we'll never know. My OP is not confined to IQ. It is a currently an issue, and has been an issue for a while. Just like the issue of "race" we're really talking about the cultures and how they interact. My appeal is to look at everything, compare and contrast (look at extremes you point out too) and see what we can make of it all. Exploration of the diversity and complexity will necessarily lead us to start second guessing our assumptions. The general aim is to "improve" human existence, not split it into categories. The categories we devise are merely convenient markers to create a better understanding right? He is quite outspoken about his view of things (Sapolsky.) He thinks in the future people who are murderers will be viewed as "ill" rather than as "criminals." I am not completely going along with his ideas here just stating the kind of things people are backing up with empirical data and interpretation. It is not simply about IQ, it is about exposing the any subtle differences in genetic inheritance and exposing that it is inconsequential and therefore educating about the differences and variety of possibilities for the individual over the myopic view of group distinction. I never said it was. Science is about measuring things and figuring stuff out. The consequences of this are neither here nor there to the scientist, and it is precisely this point that makes people conspicuous about the scientist and his moral position. I am assuming you regard culture and intelligence as natural phenomenon. So I am saying lets look at this more and figure out what it is. IQ is not the be all and end all of what defines a human, I don't believe any singular human trait can tell us anything much about an individual. What I am disinclined to say is that it is impossible to categorise and measure human traits just as we do with other natural phenomenon. I am interested in discerning what we hold as "valuable." I do not believe someone with high IQ is more value than someone with low IQ, nor do I believe that someone of low industriousness is less valuable than someone with high industriousness. Yet, we do judge things my value in some way and in some situations differences in such traits are more valuable to this or that end. If we understand the range of human diversity we can then begin to imagine how we can nurture society to better fit our natural predispositions and perhaps even find a means to literally select how who and what we wish to be given greater technological advances in the future. Or we can shirk the hard task of dealing with this and simply remain squabbling until the next, and possibly final, revolutionary ideology takes unstoppable hold. I believe we're witnessing a huge culture clash due to the internet. As with Einstein's discoveries I believe we're treading a fine line between destruction and greater discoveries. Einstein's work was never held back by ethics, yet investigations into human development is shackled, necessarily, by ethical problems. I think scientists, now more than ever, have a responsibility to do more than merely present evidence. I think they need to start more fervently applying interpretations of interpretations and feeling out social implications. I think the need for science to become political is here and now rather than remaining passively mute. Science doesn't care about humanity. Scientists are human though. The scientist cannot pretend to be "impartial" and shirk humanity for the sake of some appeal to a Science God. If it is WRONG to point out that the differences in IQ are relevant then show me why? If it is WRONG to show me that group X commits more violent crime than group Y then show me why? IQ tests exist and they correlate across many different aspects of human life and action. If by investigating said IQ we can figure out a way to better teach someone statistics (and scientists worked toward meeting this end) then is that not useful? If we can make people, through schooling, able to appreciate statistical analysis and critical thought, by understanding critical thought and how to nurture it, then ... well is that not useful in dispelling and decreasing the use of statistics to push political ideologies? And conversely, if you find you cannot imbue some people with such as mental ability then what are the political implications of this? Do we then submit only before those who can interpret the stats correctly or simply set a watershed area where those who cannot be trusted to look at the stats rationally are not allowed to look at them? In these extreme examples I am merely reflecting the current state of affairs. Knowledge is distributed unequally due to socioeconomic circumstances AND due to appreciation of the data and limits of the individuals critical thinking capacities. I have no idea how to deal with all this, but I am compelled to look more closely at this. BadgerJelly » March 12th, 2018, 1:52 am wrote: The problem with that article, or rather your pushing it as evidence, is that it is appealing to a very tiny extreme proportion and ignoring how it was that the parents could get to the position they got to in the first place. The first place may have been a century or more ago. There is no IQ correlation to inheriting money. (See Trump family) But that tiny extreme are the people who control most of the wealth, and through wealth, the politics, of the world. "intelligence" may or may not be down completely to either environment nor genetic predisposition. Both, of course, But there is a difference between native intelligence and measured IQ. What we can tell is that two people born into poverty who differ in industriousness and IQ are predictably going to "perform" differently in society. Those factors account for part of the outcome. A dozen other, unmeasurable and only partly predictable, factors also contribute to each case. So what? Extreme cases reveal flaws but they are not worth considering without appealing to both ends of the pole. It's the extremes that are noticed. The mid-range, where most people live, is invisible. People will point to a brilliant scholar or athlete who fought his way up from the slums, and use him as an example of what talent and hard work can achieve, without factoring luck, physical stamina, ruthless ambition, and the equally talented older sister who went to a mediocre job at 16, to support her siblings. Nobody notices the people who 'only' become nurses and teachers and mechanics. Someone with high IQ and high industriousness is going to either gain or keep money more easily than someone who is, to put it more bluntly technically less competent in the area they work in and less industrious. If there is money to be made and that's what they want, sure. But many of the highly intelligent and industrious are interested other matters - community work, political organizing, arts, autonomy, discovery, ecology... endeavours that a capitalist society doesn't reward. Another aspect of high intelligence that's rarely taken into account: the high rate of burnout, disillusionment, alienation, chronic depression or bipolar disorder, despair, addiction and suicide. Statistically, that may be true. Certainly not in my experience. And my argument is basically knowing, and wanting to question, is less harmful than not looking. At what? Somebody made a chart of countries by IQ rating. It suggests that the countries where knowledge is valued, and resources are dedicated to education, get higher tests scores than countries that either lack the resources or have no use for a highly educated population. That's neither surprising not helpful. The counter-argument is: even if you know what you're looking for, even if you take all relevant factors into account, you can't get reliable data. Did Einstein set out to change the face of the planet as we know it? No, he did not. And maybe some people would argue we'd be better off now without him, although I wonder if that would be true and I guess we'll never know. I very much that a theory of race and IQ based on tenuous - not to say suspect - evidence, rivals relativity in world-changing importance. I'm not at all sure that's the purpose of devising categories in this instance. It would be true of taxonomy and geological eras and weather systems, but I'm unconvinced that it's true of human organizations. Are we living in the same world? I am assuming you regard culture and intelligence as natural phenomenon. That depends on how you define "natural" and whether you distinguish it from "man-made". So I am saying lets look at this more and figure out what it is. Go ahead. But use my IQ tests rather than Mensa's. Obviously. You can be clever an evil; industrious in the production of destructive materiel; lazy and benign; stupid and honourable - we don't know in what proportions. No testing is done for those traits, because nobody has, so far, had a use for such data. That was known 2000 years ago! People have never ceased to be fascinated by themselves. we can then begin to imagine how we can nurture society to better fit our natural predispositions and perhaps even find a means to literally select how who and what we wish to be given greater technological advances in the future. We, the people in Italy, Hungary, Germany, even Finland who vote for neo-fascist candidates because they're terrified of the refugee crisis and climate crisis and unemployment crisis and debt crisis that has been created by a succession of conservative governments in the most powerful nations, so they're retreating into paranoid, armed tribalism - that we? No that we isn't going to nurture society any more now than they have in the past. He refused to work on the bomb. yet investigations into human development is shackled, necessarily, by ethical problems. Where? How? What ethical problems hold back study of human development? They don't. You're making an unbased accusation against a huge class of people. They can publish and demonstrate and sometimes they're thrown in jail. They have no more political power than any other citizen. It's easy for the rulers to ignore their advice - as we have seen - and for interest groups with lots of money to hire pseudo-scientists to undermine the credibility of real ones. Beyond that, all scientists can do is stop producing new innovations. Many scientists are working on potentially life-saving projects, but they need funding, which is under the control of moneyed interests or governments. Scientists are not a single body with a single directing agency; they're just individual persons. If it is WRONG to point out that the differences in IQ are relevant then show me why? Not WRONG - just USELESS. If it is WRONG to show me that group X commits more violent crime than group Y then show me why? It's not WRONG to show you something. It's up to to you, just as it's up to each of us, to assess the accuracy of such data. Gladly. Which groups? Which comparison? What evidence? I don't discuss X and Y, except in hypothetical terms. If you make a statement about their relative positions in any arena, I might speculate about the factors to take into consideration. That's all I can do, without firm definitions, solid research and sound findings. and they correlate across many different aspects of human life and action. Not proven to my satisfaction - for all the reasons we stated above. If by investigating said IQ we can figure out a way to better teach someone statistics (and scientists worked toward meeting this end) then is that not useful? It could be, to the person who wanted to learn statistics. If we can make people, through schooling, able to appreciate statistical analysis and critical thought, by understanding critical thought and how to nurture it, then ... well is that not useful in dispelling and decreasing the use of statistics to push political ideologies? Of course. But statistics and critical thought already exist. You don't need to invent a new teaching method; you just need to build enough schools and liberate the teachers from political dogma. And conversely, if you find you cannot imbue some people with such as mental ability then what are the political implications of this? As a matter of fact, I have taught a critical thinking course. Everybody is born with the natural ability to reason - at varying rates of speed and levels of complexity. Ideologues, ruling classes, clergy and commercial interests do everything in their considerable power to block that ability as early as possible, because they require credulous, obedient, anxious citizens, workers, parishioners, soldiers and consumers. Do we then submit only before those who can interpret the stats correctly or simply set a watershed area where those who cannot be trusted to look at the stats rationally are not allowed to look at them? Anybody can look - and each may interpret them differently, according to their own understanding, convictions, prejudices and preference. Maybe so. But everybody doesn't need them and most are no position to use them anyway. I don't consider either you or "the state" qualified to regard the adult citizens of any country your children. Looking is fine. Studying is fine. I don't think you're close to a relevant conclusion yet, nor ready to apply this knowledge to social organization. No matter how much more you learn, it will be for your own satisfaction, not for changing the world. I was writing a reply and realized it made more sense to start a thread that outlined everything better than my original attempt. I was also not trying to conflate intelligence with other human characteristics even though I am aware any form of testing cannot completely partition some idea of "pure intelligence" from human features such as "creativity", "orderliness," or "competitiveness." It is a personal interest, and I don't think I can change the world anymore than I don't think it is impossible to change the world. The better method will produce a change, science is a living proof of this. I don't see how it is irrelevant to look at human intelligence. I don't think it is useless to test and measure intelligence either - that is why we have tests and qualifications, it is show that you are competent in some given field. I might speculate about the factors to take into consideration. That's all I can do, without firm definitions, solid research and sound findings. I've attempted to do this in the new thread. I will produce graphs later showing the correlation across different areas. I've already posted the direct correlation between IQ and SATS. I agree. Assessment of education works of standardized tests, so IQ is part and parcel of this. There is a need to assess ability, and IQ is the bedrock of how we assess a students ability. BadgerJelly » March 13th, 2018, 2:50 am wrote: I hope we continue our discussion here rather than clutter up the other thread too? I don't mean to clutter. Won't even open the other thread - it's all yours. I don't, but I've learned to live with that as my default state. It is a personal interest, and I don't think I can change the world anymore than I don't think it is impossible to change the world. I was responding to your repeated statements in the vein of "We can organize society better". I asked what actions would be taken to achieve this improvement. My main contention is that people have always known that some were more intelligent than others; have recognized the range and types of intelligence - as well as other talents - in their members, but that that knowledge has not been a key factor in organizing society. Allocating tasks, yes, to whatever extent each society needed to specialize. Problem is: there have always been more clever people than the rulers could use. All the surplus clever men are regarded (with good reason) as potential trouble-makers - rivals for the leadership, or fomenters of dissent, rejecters of the prevailing doctrine - and relegated to monasteries, low-level civil service and poorly-paid pedantry. When invading another country, every imperial power seizes the fistful of engineers it can use, then kills or imprisons the intellectuals. As for clever women, their history is fraught at the very best of times; in the majority of times, they get burned or flayed, whipped or de-tongued. Most societies have been willing - positively eager - to waste half of their intellectual potential. Seven eighth, if you include slaves, serfs, lumpenproletariat and untouchables. The better method will produce a change, science is a living proof of this. You never articulated the "better method"... of doing what? I don't understand how you mix scientific discovery in with IQ graphing. Obviously, scientists come from the top 10 percentile, but only a few original scientists from every generation make a difference to anything. And they don't affect change themselves: the change comes about through the generations of technological devices which arise from each discovery. The producers of new devices don't need an IQ higher than 120; their factory workers do well enough at 90. A test for competency in a given field is not the same, and does not serve the same purpose as an IQ test. Setting standard qualifications for a job, then choosing individuals who fulfill those requirements is in no way similar to comparing the average intelligence of dissimilar nations. Putting those two ideas in the same sentence makes a coherent response difficult. And both are somewhat useful in choosing army recruits for officer training or directing high-school graduates to university courses. But since only the most gifted and well-heeled students from Gabon can even dream of attending the Sorbonne, and only a limited number of students in France attend the Sorbonne, those classmates will probably be on an academic par. So, comparing the IQ scores of the French and Gabonese populations at large has no discernible applicability. Even so I am curious what it is you think IQ measures? I'll come back to this in a minute. Neither. Like all school tests, they measure how much of the material taught that semester the student has retained by the end of the course. In History, it's a test of memory+understanding of how events and populations interacted in some particular age; In Math, it's a test of understanding of the operations; their correct and appropriate usage. A dull student - average and below - can do very well on both, with adequate preparation. The IQ test measures a range of abilities: memory, reading comprehension, pattern recognition, numerical skill, visual orientation, logic, problem solving - i forget what else is in there. The idea is to see how quickly the subject makes conceptual connections. The presumption is that none of the subjects has ever encountered this material before; that they' all coming to each question unprepared; speed of comprehension of what's being asked is part of the test. Since the test has so many different aspects, and several questions in each specialized area, it also measures in which areas a subject has greater and lesser facility. The highest scorers are those who do well in the most areas. Other advantages are: fluency in the language and culture of the test-maker, years of formal education, experience of test-taking, confidence and ease in the test environment, motivation to perform. Thus, someone who scores high in one area but wipes out in three others, may get a mediocre or even low score overall, and yet be perfectly suited to a specialized job. Assessment of education works of standardized tests, so IQ is part and parcel of this. There is a need to assess ability, and IQ is the bedrock of how we assess a students ability. No, it isn't. An experienced elementary school teacher is. I know what IQ is. I know what intelligence is. I know what a Bell curve is. I know that this range of intelligence and abilities and temperaments has always been present in any population (not just humans) and that populations of social animals have operated for millions of years without putting these measured traits on a graph. I don't see the graph making any difference to how people interact in normal life - though I can see it causing friction in academic environments. The relevance of either 'race' or nationality to any of this is still as deep a mystery as ever. Okay, maybe it would be better if you described what intelligence is? I am not sure if you meant to say that IQ tests show intelligence or not, but from my position you did. That is not to say I believe it is overwhelming accurate, but that it does actually measure intelligence; which I would define as an ability to sort, order and discern patterns across multiple fields of investigation and apply them to solve complex problems. IQ tests do measure intelligence, but they are certainly not 100% accurate. We generally assume that people who have been to university are more intelligent than people who haven't been to university - this is NOT to say we assume all people who go to university are smarter than people who don't. It is generalization which holds up in part. Where as if we look at the differences in IQ from men to women it is 50-50. I highlighted IQ because it is a common item brought up about race and generally fuels hatred and uosets people. I imagine most of you here are aware that black people perform badly in IQ tests. Even though the data looks black and white (pun intended) there are quite bkatantly some very important factors being ignored - as mentioned in the OP there is the victimhood mentality and the known effect on all tests that shows peoples mood and emotional disposition effects their results. You have an outdated, non-scientific understanding of race that is borrowed from 19th century slave trading societies. Worry not! I have arrived to this thread to get you "up to speed" on our current understanding of human genetic groupings. Lets start with Europe. NAZI ideology in Germany dictated that there was this "Aryan race" that was centered around Scandinavian countries and that there was a "polish race" separate from the "German race". At the heights of their racial insanity, the NAZIs began to claim "pure blood" that had never intermingled with the "lower races". Today, science is in posession of a giant body of evidence collected by blood. The researchers focus on mtDNA and statistically they can identify clades of what are now called human mitochondrial haplogroups. Given what we know now about human haplogroups, these NAZI claims are absolutely and irredeemably wrong. NAZI racial ideology was not scientific, and had no basis in science, as we shall see below. There are indeed two (maybe three) human haplogroups in Europe. Haplogroup U. U-humans occupy a stretch of geographic locations that in no way correspond to the existing national borders of Europe ..at all. Haplogroup U stretches from Finland, around St. Petersburg, through the Baltic States, northern Poland, and as far west as Denmark. People of the U haplogroup have extremely light almost whiteish-blue eyes and platinum blonde hair. Haplogroup H1 + H3 H1-3 humans are clustered in the far West of the European continent. Due to Roman conquest and "Christianization" , this genetic marker is now found as far north as the UK. H1-3 people in Europe today, are the most likely descendants of the Celts. The third haplogroup in europe (if there is one) is the dark haired Mediterraneans associated with Greeks, Romanians, and some Italians. Those groups become very confused, because they often bleed into the Caucus mountain countries and portions of (modern day) Iran. Very roughly Haplogroups T1, T2, and X. 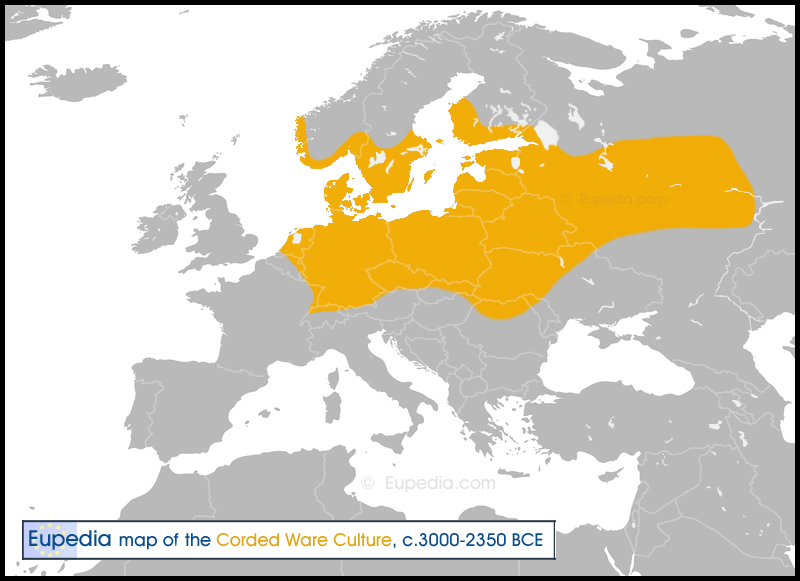 The haplogroup U should come as no surprise, as their geographic location corresponds almost directly to a neolithic civilization that anthropologists have called the Corded Ware Culture. Notice this grouping has no correlation with NAZI ideology. Polish, German, Swedish, and Lithuanian are all the same genetic pool! Now that's Europe. Lets turn to Africa. A number of different times in this thread, BadgerJelly has referred to a "black race". Does such a thing exist? It turns out that the genetic diversity inside the African continent is so vast and so differentiated that mtDNA studies cannot even reliably be used there. Researchers who study mtDNA and who collect it from blood samples have complained that it would be hopeless to try to trace a person's ancestry back to Africa, starting from a sample taken by black person living in Detroit (for example). Black is a skin color, yes, but in terms of the black populations in Africa, there are significantly more different from each other than they are from those groups outside of Africa. A redhaired british girl is likely closer in genetics to a Japanese girl, than a Nigerian is to a Kenyan. The vast genetic diversity in Africa, and the low genetic diversity in groups outside of Africa is pointed to as evidence for the "out of Africa" hypothesis. In any case, there is no such thing as a "black race". What is actually in Africa is a bunch of varied black races. They share skin color, but outside of that, they share no other genetic material. Black students in inner-city schools have consistently scored lower on standardized tests than their white counterparts. That research had even adjusted for poverty and reading level and other factors. (Even after masking off those 'cultural factors', they were still scoring lower.) When the findings were published in a book, it caused a huge outcry from the media and from talkshow hosts. I do not disagree with the key findings of that research or its statistical methods. However, I would point out that the slave trade into the USA only took place in a tiny window compared to the vast history of human migrations. The descendants of slaves living today in the USA likely all came from the same (tiny obscure) genetic group on the coasts of west Africa. They "best of the best" were not brought over on ships to work the agricultural crops. The poorest, must uneducated, most desperate tribal people were shipped over and sold. The point I'm driving at here is that black inner-city youth are a terrible sampling of Africans, in terms of statistical sampling error. Even if Nigerians , Cameroons, Senagalese, and Ghanans were very thoroughly sampled, the results of that research would not translate to Kenyans, Somalis, and south Africans. I already explained why. They are totally different groups, genetically speaking. People do refer to themselves by skintone sometimes. There are organisations that use these labels. Like you I am keen to vanquish them. BadgerJelly » March 14th, 2018, 12:56 am wrote: Okay, maybe it would be better if you described what intelligence is? I am not sure if you meant to say that IQ tests show intelligence or not, but from my position you did. Fundamentally, intelligence is a facility for making connections. I think I did say that. That connection-making can be applied to all kinds of objects, problems, processes, numbers, memory, cause-and-effect chains, observation, formulas - all kinds of things. Not every intelligent person exhibits every type of facility, but whichever they have more of helps them learn faster and reach logical conclusions more easily. IQ tests do measure this facility - so long as the test-designer and the test-subject have similar modes of thought - which generally means they've come from the same culture and educational style. That's a prejudiced assumption, sitting on top of other ill-founded assumptions. You can assume that very stupid people can't get into university, but you can't assume that intelligent people 1. want to 2.have the opportunity 3.can afford to go to university. Certainly, people with university education have a long experience of test-taking, so they're more relaxed and confident that a farm-hand would be. - this is NOT to say we assume all people who go to university are smarter than people who don't. Most people do assume that, including the graduates themselves. Most people also assume that university graduates have an easier time in the world than everybody else, but this is no longer true, especially if they carry a $50,000 debt and their economic niche has closed up. At this moment, the most sought-after skills are not academic but technical, caring and trades. Paper-sorting is increasingly done by computers, just as heavy lifting is increasingly done by robots: the blue and white collar jobs are disappearing; grey and pink are your best bet. Different types of skill, different types of intelligence, different attitudes. Worry not, Forrest Dump posted early in this thread on the obsolescence of the concept of race. I've stopped following the thread, as it's hard for me to really care about all these vague and unsupported metrics. As Serpent (IIRC) pointed out earlier, a competent elementary school teacher can spot aptitudes and help students build on those, while filling in cognitive gaps.